Pine Orchard Nursery School (PONS) is an independent, nonprofit, parent involved preschool located in the Indian Neck section of Branford. 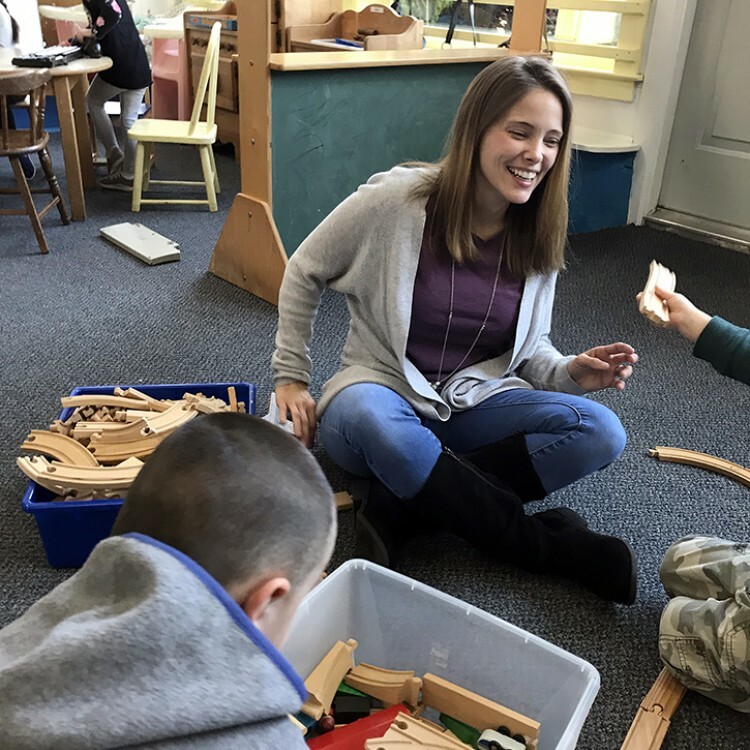 The experienced teachers at PONS are dedicated to providing a safe, nurturing, developmentally-appropriate learning environment for children of preschool age. The educational goal at PONS is to facilitate the social, emotional, physical, and cognitive growth of each child. Pine Orchard Nursery School (PONS) was founded as a parent cooperative in 1939 and presently exists in the "little red school house" at 149 South Montowese Street in Branford. Almost seventy years later, PONS maintains its original mission: to provide an exceptional preschool experience in a parent-involved school. At PONS, we strive to nurture a child's innate sense of wonder and curiosity. Our teachers encourage exploration and growth in an environment that is safe, stimulating, consistent, and nurturing. We encourage cooperation, communication, and respect for others. We believe that school should be a happy place, and we strive to make every child's first school experience a positive one. Through cooperation and communication, parents and teachers work together and form relationships which create a community spirit. Preschool children find comfort in this close relationship between school and home. Parents are always welcomed into the classroom, encouraged to observe and participate. Everyone at PONS is a learner - the children, the teachers, and the parents. Together we create a community of learning. If you're interested in reading more about how current research supports our educational philosophies, take a look at some of this writing. David Kohn's op-ed, "Let Kids Learn through Play", for the New York Times describes studies that support child-initiated vs. academically oriented learning. 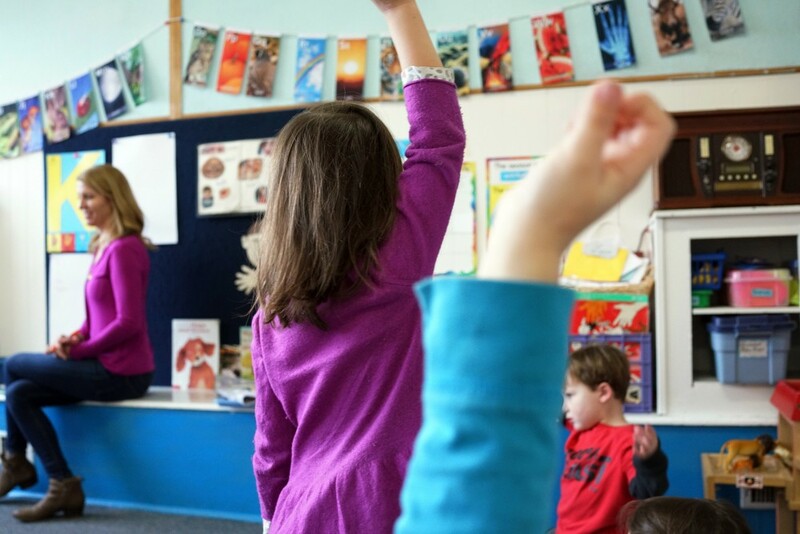 "The Building Blocks of a Good Pre-k" by Shael Polakow-Suransky and Nancy Nager talks about how, for preschool students, play is the best way to learn. In Branford Patch article "Learning through Imaginative Play," Alana Joli Abbott reported on how Gladys Deutsch, Director at the Leila Day School, and Early Childhood Education Consultant Barbara Stern explained current early childhood education research at the 2014 PONS Annual Meeting. Angela Hanscom wrote in the Washington Post, in "The decline of play in preschoolers—and the rise in sensory issues," that the focus on academics at the expense of play can lead to young children not developing the necessary social skills to get along in elementary school. I'm a teacher and the director at Pine Orchard Nursery School. I live in Branford with my husband, two wonderful children, a dog, two cats, and our leopard gecko named Yoda. When not teaching, I love hiking and creating art. I have been teaching for many years, mainly art classes, before coming to PONS. I have taught children of all ages, but the preschool age has a special place in my heart. I love being a part of the PONS community; it is a very special place. I studied art and education at the University of Vermont, Humboldt State University, and Southern Connecticut State University, as well as various private art schools in Connecticut and California. I graduated in 2000, with a dual major Studio Art and Art Education. In 2015, I went back to school for my director’s credential. I have taught at The Children of the Redwoods, in Arcata, CA, Roberto Clemente in New Haven, Mary T. Murphy School in Branford, The New England School of Montessori, formerly in Milford, and at the Tabor Community Art Center, in Branford. I have enjoyed being a teacher (and head-teacher) at the Pine Orchard Nursery School since 1987. Before teaching at PONS, I taught a summer program for children ages three to twelve. I was a nanny for a family with three children, and had a daycare in my own home for several years. My degree is in Early Childhood Education. My mom, Valerie Erickson, preceded me here as a teacher and director, and my daughter, Ericka, is now on staff as teacher and director. I have enjoyed my over 32 years here! I am thrilled to be a part of Pine Orchard Nursery School. I am a very active mother of three wonderful children (Emma age 12, Cole age 10, and Addyson age 5), and have dedicated the last 12 years to raising them. My two older children went to PONS, and I fell in love with the intimacy of the school years ago. Over the past five years I have served as the VP and President of the PTA at John B. Sliney elementary school, and have enjoyed helping children interact through social activities. In my free time I love reading, baking, exercising, boating, and gardening. I am also a calligrapher and have a small business, Emma Grace Calligraphy. Prior to being a stay-at-home-mom I held positions at Yale and at the Broad Institute of MIT and Harvard doing biological research. I received my BS at the University of Connecticut and my Masters in Biology at Harvard University. Most of my volunteer work has revolved around young children, and also includes the NICU at Yale New Haven Hospital and years on the fundraising committee for PONS. I am excited to have the opportunity to be a daily part of your children's preliminary education, and my purpose is to make sure each school experience is a great one for the students. I have enjoyed meeting all of your children and I look forward to many exciting times ahead! Some of you may know me as Ms. Wendy through our connection of Girl Scouts or from Tisko Elementary. I am a wife, and the mother of two beautiful children, and we live along with our dog Jack. On my downtime I enjoy reading, writing stories, scrapbooking, gardening, hiking, and working on all kinds of art with my children. In the springtime, my family and I enjoy the camping adventures. All my life I have been around children: it all began with my own parents raising a family of eleven children and over thirty grandchildren. The professional end of my teaching began when I was nineteen working with toddlers, and then working in the preschool classroom. From there I continued this journey as a college student earning my Associate, Head Teacher, and Child Development Associate degrees from Gateway Community College. But I didn’t stop there; I furthered my education at Post University, earning my Bachelor's Degree in Child Studies, acquiring over 400 hours of student teaching along with being NAEYC-accredited and also earning my Early Childhood Teacher Credential - all while being a mom. My love for being outdoors and teaching continues to keep growing, so I have opened up my own Tinkergarten outdoor classroom, which encourages children to explore nature, all while building on their developmental skills. In the future I hope to return to school for my Master's Degree.